Kit Miyamoto thinks buildings shouldn’t just remain standing after a big earthquake. They should remain structurally sound. 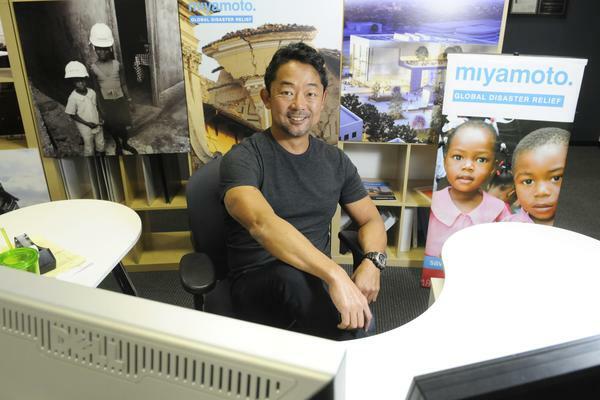 Miyamoto, president and CEO of seismic engineering firm Miyamoto International, is on a mission to promote that view. Miyamoto said his interest in seismic engineering started during his childhood in Japan, where he remembered feeling earthquakes weekly. After studying engineering in the U.S., he joined what was then Marr Shaffer & Associates in 1990. After buying the company seven years later, he eventually changed its name to Miyamoto International. In 2000, the West Sacramento company opened a branch office in Los Angeles. Miyamoto said he could see a global need for seismic expertise, even though the firm had no international presence at the time. Now it has offices in eight other countries, including Italy, Turkey and Thailand, and 200 employees. To Miyamoto, the seismic need is local as well. Even though earthquake risks are lower in Sacramento than in San Francisco or Los Angeles, Miyamoto said, it’s still 10 times what cities in Texas might face. Sacramento also has many state offices that need to be sound if there’s a major seismic event, he said, adding that a lot of the city is built on soft soil that’s more susceptible to disruption from seismic waves. As large-scale tremors grab headlines around the world in recent years, Miyamoto has found himself increasingly traveling to quake sites and literally picking up the pieces to figure out what happened. He’s concluded that seismic strengthening — adding elements to existing buildings to shore up their resistance to earthquake damage — is worth the investment. Retrofitting can mean the difference between a building that must be abandoned and one that’s still functional, he said. A 2011 quake killed fewer than 200 people in Christchurch, a New Zealand city of more than 300,000. But three-quarters of the 2,400 mid- to high-rise buildings in the central business district were too damaged to repair, Miyamoto said. In other ways, Christchurch was fortunate. Ninety percent of building owners there have some form of earthquake insurance, compared to about 10 percent here, Miyamoto said. In comparison, even the concept of seismic strengthening for schools was missing in Haiti, where an earthquake in 2010 killed nearly 200,000 people. Raising $300,000 through a nonprofit arm, Miyamoto International developed and built a new school in Haiti after the quake. Miyamoto said that it’s seismically strong enough so that he’d send his own kids there. Even if it ultimately pays off, Miyamoto said he still has to sell building owners and developers on the concept of seismic strengthening. The work adds 5 percent to construction costs overall, he said. Only recently has he been able to convince owners of the benefits. Though his focus has become more global, Miyamoto is active in local projects as well.Kipp Blewett of Rubicon Partners said Miyamoto was a big contributor to the retrofits necessary to open the Citizen Hotel in downtown Sacramento. With that global presence, Miyamoto International is starting to look outside just seismic safety. Earlier this year, the firm opened an office in Liberia, with the idea of leveraging the company’s knowledge in construction to help build low-income housing there. As the Ebola virus became an epidemic, the mission changed to building medical infrastructure instead, Miyamoto said. Increasingly, that may be how the company expands, by taking what it’s learned in seismology and applying it in other ways, including risk management and nonprofit work, he said. The company’s growth is reflected in its gross revenue, which totaled $16.3 million last year. That’s up from $15.05 million in 2012. But even with plans to open offices in India, Bangladesh and Colombia this year and next, Miyamoto said the base of operations will stay here. With his children attending good schools in Davis and his firm having great access to talent coming out of California universities, he said there’s not much reason to move.